FOR USE WITH A30 SERIES PROPELLERS. New Hustler Turning Point Propeller10-1/2" x 13. Right Hand Rotation. 90hp to 300hp w/ 4-3/4" Gearcase. New Stainless Steel prop, will fit Mercruiser sterndrive and Mercury motors, has change- able hub to fit any motor. Hub kit is usually around 40$. Prop is a Turning Point 14.5x 17 pitch. Turning Point Hustler Propeller Honda, Johnson/Evinrude - Aluminium OEM# QA2084R OEM Ref QA2084R. 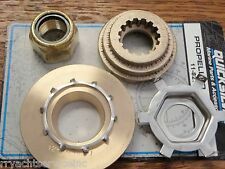 Hub Kit #510 for VOLVO® AQ200, AQ250, AQ270, AQ280, AQ290. Never buy another hub kit system again. Eliminate hub cracking & failure. Corrosion resistant materials - brass splines. Inner splines adapt to the engine. TURNING POINT Hustler Propeller Aluminium OEM# 48-8M8027502 OEM Ref 48-8M8027502. 14 1/4 in. Does not include hub - designed to work with Turning Point MasterTorque interchangeable hubs. © Marine Parts Source. Star Brite 93016 StarTron Gasoline Additive 093016 16 oz. Sierra Rotor 18-5407. Pitch Does not include hub - designed to work with Turning Point MasterTorque interchangeable hubs Four blade Fits 135 to 300 horsepower outboards and stern drives with 4 3/4 in. gearcases Perfect for runabout, fishing and bay boats Replaces Turning Point LE-1419-4. Replaces Turning Point 501. For use with Turning Point interchangeable hub propellers. © Marine Parts Source. Star Brite 93016 StarTron Gasoline Additive 093016 16 oz. Sierra Rotor 18-5407. You might also like. 13.25 x 19 3 BL AL RH. © Marine Parts Source. Star Brite 93016 StarTron Gasoline Additive 093016 16 oz. Sierra Rotor 18-5407. You might also like. Hustler High Performance series propellers are the only aluminum propeller manufactured with performance enhancing vent holes. There's a Hustler propeller perfect for almost any boating application. Product Specifications Propeller Model Number:LE-1419Propeller. NOTE: Not applicable with Turning Point's 10, 20 and 200 Hub Kit series. Number of Blades:3 Blades. Interchangeable Upgrade to Competitors Hub and Prop Systems. Part Number: 21501930. Hustler High Performance series propellers are the only aluminum propeller manufactured with performance enhancing vent holes. There's a Hustler propeller perfect for almost any boating application. Turning Point Hub Kit: 501. Never buy another hub kit system again. Eliminate hub cracking & failure. Corrosion resistant materials - brass splines. Inner splines adapt to the engine. Pitch 4-Blade Hustler Aluminum Propeller HousingDoes not include hub - designed to work with Turning Point MasterTorque interchangeable hubsFour bladeFits 135 to 300 horsepower outboards and sterndrives with 4 3/4 in. Manufacturer Part Number: 2143 1930. (4) Liquid like maintenance products. (3) Paint and chemicals. (1) Open software. (below the price of the item). HAZARDOUS PRODUCTS (HAZMAT). FREE LOCAL PICK UP. Hub Kit #13. Never buy another hub kit system again. Eliminate hub cracking & failure. Corrosion resistant materials - brass splines. Inner splines adapt to the engine. Eliminate propeller vibration & chatter. Newer performance enhancing design provides maximum top end speed, secure handling, and quick acceleration. Rotation: Left Hand. Material: Stainless Steel. Pitch: 19". Our products are designed and manufactured to the highest quality, safety, durability, and performance standards. Turning Point 21502131 Aluminum Propeller Housing 14 x 21 4-Blade RH 14X21X4B Four Blade Hustler HousingReplaces Turning Point 21502130. Replaces Turning Point 21502130. 14X21X4B Four Blade Hustler Housing. Turning Point 21501530 4-Blade Aluminum Propeller 15 x 15 RH 15" x 15" Hustler Aluminum Propeller Right hand rotation Features exclusive Squeeze Cast aluminum construction 4 blade Hustler design provides incredible hole shot, corning, high speed and maximum stern lift 15 in. Newer performance enhancing design provides maximum top end speed, secure handling, and quick acceleration. Rotation: Right Hand. Material: Stainless Steel. Pitch: 21". Our products are designed and manufactured to the highest quality, safety, durability, and performance standards. Turning Point Hub Kit: 509. Never buy another hub kit system again. Eliminate hub cracking & failure. Corrosion resistant materials - brass splines. Inner splines adapt to the engine. Pitch Hustler Aluminum Propeller HousingDoes not include hub - designed to work with Turning Point MasterGuard interchangeable hubsFits 40 to 75 horsepower outboards with 3 1/2 in. gearcasesBest for lower horsepower pontoon, fishing and work boatsHustler mide-range propellers have increased blade area and cupping to bite the water and provide excellent all around performanceReplaces Turning Point H1-1013. Eliminate Propeller Vibration & Chatter. Turning Point Hub Kit: 501. Never Buy Another Hub Kit System Again. Eliminate Hub Cracking & Failure. Dont see what you’re looking for?. Let us know. Custom or special orders may take longer. 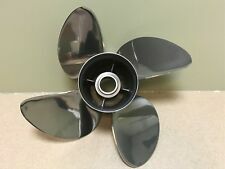 Boat part number 1070116 is a new 3 blade, 15" x 19 pitch, left hand boat propeller from Turning Point Propellers, Voyager series, part number 31521920. Part Number: 31521920 / 3595115. Constructed out of stainless steel, this propeller features 15" x 19 pitch, 3 blades, and left hand rotation. Note: A Hub Kit is required for installation of this propeller. See the Turning Point Selection Chart or the Prop Wizard for hub kit selection. Size: 14.5 x 17 - 4-Blade. Why choose Bumboat?. Pitch Hustler Aluminum Propeller HousingDoes not include hub - designed to work with Turning Point MasterGuard interchangeable hubsFits 40 to 75 horsepower outboards with 3 1/2 in. gearcasesBest for lower horsepower pontoon, fishing and work boatsHustler mide-range propellers have increased blade area and cupping to bite the water and provide excellent all around performanceReplaces Turning Point 21301710, H2-1117. Turning Point Propellers 21432111 Prop Hustler 3b Al 13.25x21 Rh. Used once. Universal flo-torque hub design. Fits Yamaha, Mercury, Honda Hub not included. Manufacturer Part Number: 2143 1730. (4) Liquid like maintenance products. (3) Paint and chemicals. (1) Open software. (below the price of the item). HAZARDOUS PRODUCTS (HAZMAT). FREE LOCAL PICK UP. ITEM: Aluminum Propeller MAKE: Hustler MODEL: LE-1419-4 CONSTRUCTION: Aluminum DIMENSIONS: 14 x 19 CONDITION: New in box! Trending at $91.03eBay determines this price through a machine learned model of the product's sale prices within the last 90 days. Normalized SKU: 21301210. Turning Point Propellers 21301210 Literature Download Quick Reference Guide. Hustler High Performance series propellers are the only aluminum propeller manufactured with performance enhancing vent holes. Turning Point Propellers Part #21501730. This combination results in the highest performance aluminum propeller on the market, unmatched in cornering, acceleration, boat handling, and top speed. Hustler 4 Blade Propeller Aluminum 14.5 X 17. This propeller is manufactured by TURNING POINT. Rotation: RH. Part # R1-1011 2120 1110. This prop does require a hub kit. Material: Aluminum. Eliminate propeller vibration & chatter. Turning Point Hub Kit. Never buy another hub kit system again. Eliminate hub cracking & failure. 4 CYLINDER 75HP TO 115,120 ( 1986-1994) 125,135 (1973-1976) 140HP (1977-1984 AND 1986-1994). Hustler Aluminum Propellers Rotation RH. Stainless steel performance at aluminum prices. Pitch 4 Blade Patriot Stainless Steel Propeller HousingDoes not include hub - designed to work with Turning Point MasterTourque interchangeable hubsFits 135 to 300 horsepower outboards and sterndrives with 4 3/4 in. New in the box, never used. We are located in one of the largest pleasure boating areas in the United States. source of most of our inventory. Combined boating experience of over 100 years. One of us will probably know what you are talking about. INCLUDES HUB. BLADES 3 ROTATION RH. This propeller is manufactured by TURNING POINT. Rotation: RH. Part #2121 1110 R2-1011. This prop does require a hub kit. Material: Aluminum. Part Number: 21501730. This combination results in the highest performance aluminum propeller on the market, unmatched in cornering, acceleration, boat handling, and top speed. Turning Point Hustler Aluminum 4 Blade Prop. 4 BLADE PROP. FITS YAMAHA. For use with Turning Point interchangeable hub propellers. Replaces Turning Point 11, 11300100. Buy now and save! © Marine Parts Source. Star Brite 93016 StarTron Gasoline Additive 093016 16 oz. Sierra Rotor 18-5407. Turning Point 4-Blades Hustler Aluminum Propeller -Diameter: 14 Inches -Pitch: 19 Inches -Rotation: Left Hand -Hub Sold Separately.